Two Elon Moreh residents,were assaulted by Arabs and anarchists while preparing for the Sabbath inside the town. Arson at Gilad Farm in Shomron. Two residents of the Jewish community of Elon Moreh in Shomron Samaria) were assaulted around noon on Friday by a large group of Arabs and foreign Anarchist activists. The two Jewish residents were doing maintenance work on the community's Sabbath eruv http://en.wikipedia.org/wiki/Eruv within the boundaries of the community when they were jumped on and attacked by the group. The two were hit repeatedly with stones and metal bars. The Shomron Regional Council has been informed by the IDF that local Arab farmers have been clearly told which dates are coordinated for harvesting in the nearby area and that Friday there was not to be any harvesting. Apparently, the group entered the Jewish community against the orders of the local authorities in an intentional effort to reach a confrontation. The two assaulted men succeeded in breaking away from their attackers and in calling the community's security guards and the IDF. 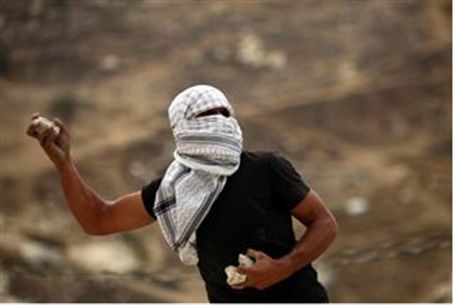 However, the arrival of reinforcements had no immediate effect and only after shots were fired in the air by IDF soldiers did the attackers cease throwing stones at the IDFand leave the area. Gershon Mesika, director of the Shomron Regional Council (who is a resident of Elon Moreh) said: "Every year as the olive harvest approaches, left wing extremists from Israel and abroad come into this region with the goal of causing provocations and conflicts. I call on the police and army to keep these hooligans out of the area in order to prevent the violent events that they cause here. Jews and Arabs both harvest our olives and would be glad to do so in peace, but even the needed pruining of olive trees after the harvest by their respective owners has been called willful Jewish destruction by outsiders who know nothing about growing olives, but a great deal about generating anti-Israel publicity." David Ha'ivri, director of the Shomron Liaison Office observed: "There are a number of NGOs (non-governmental organizations) whose mission it is to protect the rights of the 'poor Arab' farmers. Rabbis for Human Rights and Tayush for example trip over each other in competition for the ability to expose to the world the importance of their work in protecting the 'oppressed'. Actually, in many cases the activities of these foreign organizations have proven to be staged provocations in which media representatives have been invited to confrontations that were planned and that in most cases would not have happened had they not been orchestrated intentionally by these groups who are looking for media attention. "The motivation of these organizations to cause these reports is two fold. On the one hand they have an 'ideological' agenda to portray the Jewish residents in Yehuda and Shomron (Judea and Samaria) as a bunch of violent bandits, but not less important for them is to show themselves as saviors of the oppressed. By preserving the conflict in spite of the authorities' intervention, they are trying to show that they are needed to to make peace--or at least to protect the farmers whom they claim 'have no one to look out for their rights'." An eruv is a halakhic, Jewish legal method for delineating the borders of a community in order to make it defined as one unit, or private domain. It enables carrying objects, otherwise not allowed, from one place to another on the Sabbath. An eruv exists in almost every community in Israel, on all IDF bases and in large Jewish communities around the world, but must be checked each week to be sure it is halakhically intact. The two men, observant Jews, were on a routine, weekly check when attacked. Shortly afterward, a large fire broke out at Havat Gilad, the Gilad Farm in central Shomron. IDF artillery brigade soldiers who were at the scene saw an Arab fleeing the blazing field but did not manage to apprehend him. The hot winds and high temperatures in the area caused the fire to spread and destroy the fields of clover, trees in Arab owned olive groves and even approach the Farm's homes. Firefighting forces managed to put out the fire before it reached the homes, but the head of the farming community, Iti Zar, said that tens of thousands of shekels' worth of agricultural products were destroyed..